It was early in the morning. The sun had yet to crest the mountains but its presence backlit the landscape, promising more to come. The scenery was vast. Open land, expanses of blue yonder with jagged hills towering over dusty topography. The sky took up the biggest portion of the view. Plants fit for arid climates showed themselves off, such as the impressive cacti, daring anyone to get too close. Life was milling about: birds, cows, the antelope-ish horned animals and evidence of the wanderings of jack rabbits too close to the road from the night before who had not fared so well. The vultures were scoring breakfast. Nature’s brutal cycle of life unfolding on the road. This was just another morning in the Texas High Desert. For us, it was a special treat, the day we first met Ricky Taylor, the young visionary behind Alta Marfa. His property is on The Blue Mountain Trial, in the Davis Mountains, about 30 minutes from Marfa, Texas. Hence the name. If you’re quick to do a spanish translation, alta is in fact, high. The elevation for Alta Marfa proper is 5,400’. That is somewhat more than a mile high, which would be 5,280’. Technically Alta Marfa is closer to the town of Fort Davis than Marfa. But for the man who wants to make wine that it is art, Marfa is far more his style. 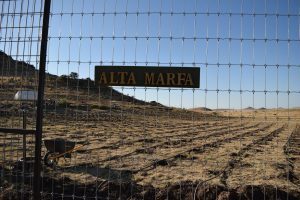 For you wine people Alta Marfa also borrows from the name of a sub-region in Spain, Rioja Alta. Marfa, Texas, population 2,000 is 3 hours drive to the nearest airport, El Paso being one. A haven for artists, craftspeople, celebrities on mini-vacay and nostalgic James Dean fans. Made famous for the lore of The Marfa lights, a phenomenon not quite explained, that has attracted travelers since the 1800’s. Then in the 1950’s, the film Giant was made there. The cast which included Elizabeth Taylor, Rock Hudson and James Dean all stayed at the local Hotel Paisnao, still operating today and boasting many photos from the movie in the lobby for all to see. The town has a Dairy Queen, but I saw no other big corporate entities. Marfa, more like a larger village, fairly walkable on cooler days, is teeming with locally owned artisan shops and very tasty restaurants. What’s more is that the energy is invitational. Folks wanna chat and share the distinctiveness of the place. It is no wonder that Ricky is connected to this vibrant community. Ricky Taylor has a vision. 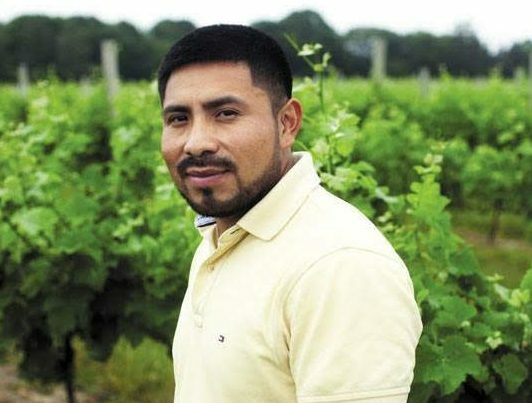 He wants to make beautiful wine of place on his 3 acres in the Texas Mountains AVA (American Viticultural Area). He has a plan of how to get there. 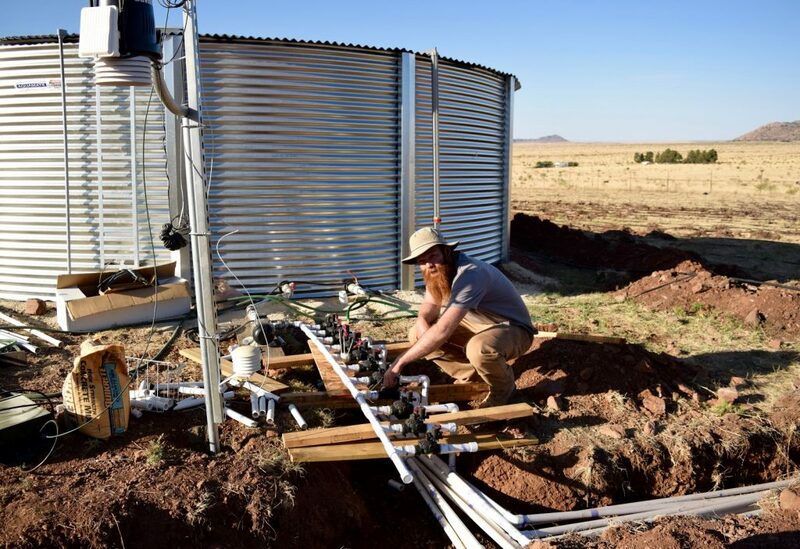 He is a California native with some winemaking experience and major skills as an engineer. 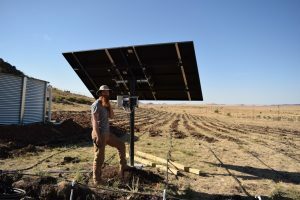 He has installed a solar powered irrigation system that he can control from his homebase in Houston. When he sets his mind to something, he does it. Always been that way. This was emphasized by both his parents when I met them at Alta Marfa. 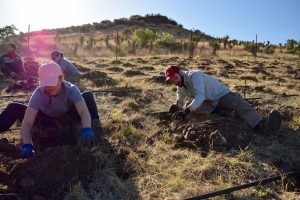 In late April Ricky and his supportive and handy partner Katie, invited their friends, family and friendly strangers alike to come to Alta Marfa and help plant the vineyard. And they did. 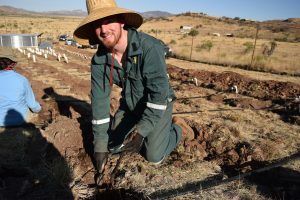 Upwards of 30 people shed their urban frenzy to take to the Blue Mountain Trail and plant 6,000 grape vines in some rocky, steep, unforgiving land. Some pitched a tent on the property, others opted for more luxurious lodging (read: with indoor plumbing) in the nearby towns. These were not skilled laborers. The people who came, even the friendly strangers, were those who caught his contagion and believe in his creation. They see what he sees and want to help make it happen. (J) When did you realize you wanted to be a winemaker? (R) I love learning and ever since I was very young I have learned through listening and then doing. I built a snowboard when I was 10, I have made my own clothes, I’ve always enjoyed cooking. 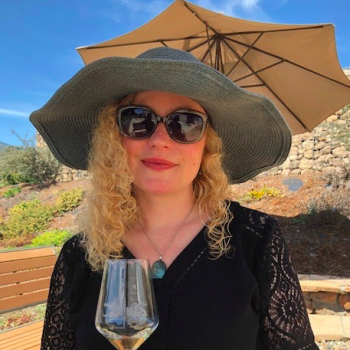 When I first started to become interested in wine as a consumer, I started reading a lot about it, and attempting to make my own wine was a logical first step for me. 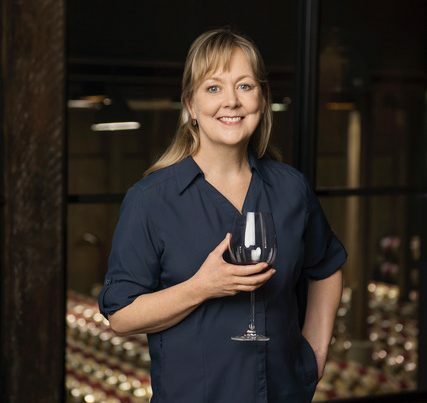 As far as being a “wine-maker”, which I guess is someone who makes wine as their job, I decided to do that after working a few years at a corporate job and realizing that I wanted to work for myself, making wine is a way for me to do what I do for fun as a job. (J) How did you get involved in the wine industry? (R) My favorite thing about the wine industry is how willing to share people are. 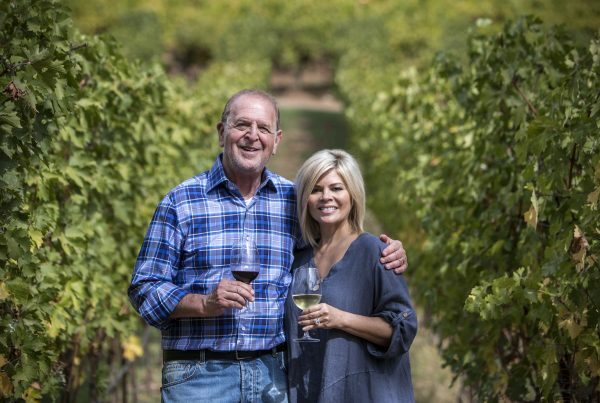 Over the past two years I have been able to meet the people who make the wine I love to drink and ask them tons of questions. Almost all of my very limited wine knowledge comes from books or the internet, or podcasts, so it’s all theoretical. Getting to ask people with real life experience to kind of confirm everything I think in my head is so valuable. Everyone has been so patient with me, I’m very grateful. I think generally people in the wine industry are so willing to answer questions in this way is because they genuinely enjoy what they do. (J) What do you love most about your work and why? (R) More than two years in I am still very early in the process, but I really enjoy doing something that is so long term. There is no finish line, the plan is just to continue to make progress. It’s very comforting. (J) What is your winemaking philosophy? (R) While I haven’t made any wine at Alta Marfra yet, this question is easy to answer. One reason why I have chosen the Davis Mountains is that I think the place offers an opportunity to make something new that people (myself included have not tasted before). In order to make a wine that tastes and smells the way it does because of where it comes from, it cannot be over produced. To me that definitely means the goal would be to make wine with one ingredient. (grapes) Notice I said “goal”, I am not opposed to using sulfur if it will further the goal of making a wine expressive of where it comes from, but I don’t think I would ever chaptalize or acidify. I think farming is where you can pull the sugar and acid levers, rather than fixing later. That’s why when decided to make wine I immediately realized that I wanted to be the farmer also. (J) Who has had the most influence on you in your current career? (R) First of all, my parents. If I was at all sensitive to people telling me that my idea wouldn’t work, I would have already given up, and probably never started this project. I have my parents to thank for that. For an answer more specific to wine, Levi Dalton’s Podcast “I’ll Drink to That”, I would say 80-90% of what I know about everything to do with wine has come from listening to his excellent interviews. (J) What was your most memorable wine-travel experience? (R) Honestly I have not done a lot of wine traveling, The last two years I have been traveling from Houston to west Texas multiple times per month working to plant the vineyard. I recently made a short trip back home to California though and in two days visited : Dirty and Rowdy, Martha Stoumen, Les Lunes, Massican and Matthiasson. It was super cool getting to meet all those people who make some of my favorite wines, and get to ask them tons of questions. (J) Why Texas? Why the region you selected? 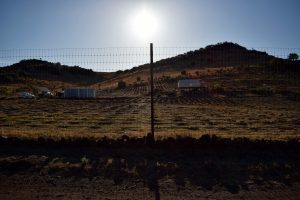 (R) Why Texas starts with, because I wanted to plant my own vineyard and I am not a millionaire, the more obvious places, Oregon, Washington, California, were out of the question. Both because the land cost is so much higher there but also because I am still working full time in Houston, to pay for everything. Texas is a big place, most of Texas is very hot. I typed into google “where is the coolest weather in Texas?” the Davis Mountains are that place. 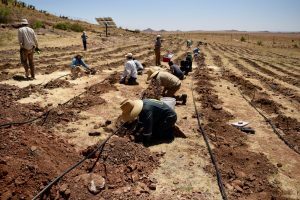 I looked further and found the volcanic soils, beautiful landscape, lack of humidity and high altitude made it very attractive. (J) Why did you choose Cabernet Sauvignon as the dominant variety? (R) I chose cab because it has a late bud break ( there is significant risk of frost due to the high altitude) and loose clusters ( I don’t want to have to spray to prevent bunch rot, which is a significant risk because summer is the rainy season) it was not chosen because of the marketability. (J) What challenges does your region face? (R) Even though we are at the same latitude as Cairo, The high altitude (5,400’) makes spring frost a real challenge. The other main one is it only rains 15 inches a year, but it’s all in the summer. So it’s going to rain on the grapes, but most of the year it is extremely dry and windy. (J) Can you make a single prediction about the future of your wine region? (R) Right now I would say less than 1% of “wine people” around the country/ world even know the Davis Mountains exist, in 20 years Everyone will know. (J) What was the first wine you remember tasting? (J) What wines do you like to drink (varietals, styles, countries etc.)? (R) I drink a lot of what I would call “new California”, which ironically usually comes from the oldest vineyards. Dirty and Rowdy, Les Lunes, Martha Stoumen, Bedrock, La Clarine Farm, it also often comes from vineyards not in Napa and not in Sonoma, so Sierra Foothills, Mendocino county, Lake county, Contra Costa. Also I have been drinking a lot of sicilian wine, COS, Arianna Occhipinti, Cantine Barbera, Frank Cornelissen. Southold Farm and Cellar just moved to Texas from Long Island and I have really enjoy their first vintage of Texas wine. These all tend to: have acid, less alcohol, don’t taste like new oak. (J) Now that the vines are in what is next? (R) Right now we are just waiting to see the vines grow, and will be putting in a training stake next to each vine before the end of the growing season. Each vine will be trained up its respective stake. I plan on being there once or twice a month for the rest of the growing season, so not as much as before planting (every weekend), but still pretty frequently.